This weeks picture was a T-shirt design but currently I don't have the capitol to get it printed up Still I have a new capitol stream coming in soon so we shall see. 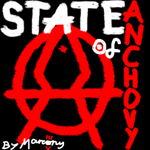 In the mean time Anchovy T-shirts are avaliable right now. On Wednesday I'll be heading up to the Whitby Goth Weekend for all the normal partying. This leaves to things to be said: Firstly, There won't be a strip Next week (2nd of November strip) as I won't be here to put it up and I'm not even going to contemplate methods by which I can do it from Whitby as I don't intend to have time. Second, if you will be at Whitby and you want a Anchovy T-shirt Whitby is the best time to get one because I'll be doing them at £10 a piece. Just E-mail me on Marcony@Darkfurr.co.uk and let me know what size and sleeves you want and then hunt me down with a tenner at Whitby. My picture is on the T-shirt page modelling it (Clue: I'm the one that's not a woman). Enjoy The Anchovy.